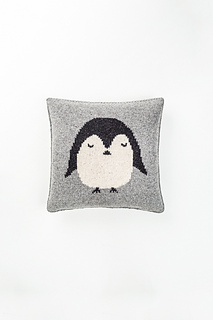 Add a touch of whimsy to a child’s bedroom with Winslow, a sleepy penguin ready for a cuddle. 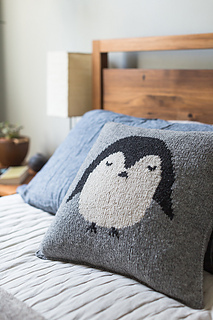 This irresistible fellow is worked in intarsia from three shades of Shelter, and his pillowcase fastens with a moss stitch button flap for artisan good looks and easy removal for cleaning. 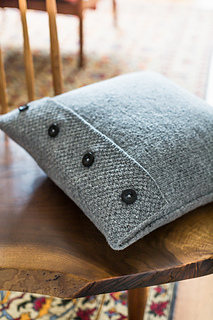 The pillow is knit flat in pieces and seamed with decorative slipped selvedge stitches exposed. If you’ve never worked intarsia before, this project is a great way to begin, and the method is thoroughly explained in the pattern. 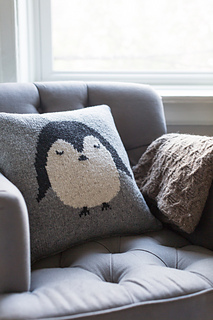 Penguins love company, so you may find Winslow needs a cousin to join him on the sofa! Please note: the stitch patterns in this pillow are charted only.